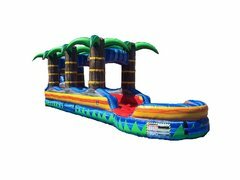 UBounceinc.com has a great selection of water slide rentals for our Central Kentucky customers. 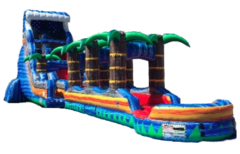 Choose from a variety of themes, colors and sizes, including the hot, new bounce & water slide combos or the huge 22ft Tropical Tsunami Water Slide with Slip N Slide! All of our water slides are manufactured from "lead-free" vinyl and are cleaned and sanitized before every rental. Browse the selections below and click on the image or "More Info" link to get additional information and to make a reservation. Having a fundraiser, company event, or school carnival? Another fun water related item is our Dunk Tanks or Dunking Booth rentals which is a fun way to have everyone participating. All ages love to watch and try their luck at dunking the dunker! Act quickly! 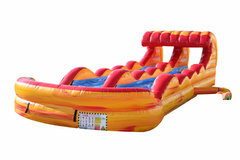 Inflatable water slide rentals are a very popular rental for summer time parties. We recommend to reserve early and we'll make your party the best ever! 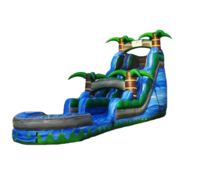 The best selection of commerical grade water slide rentals for all ages, young and old. 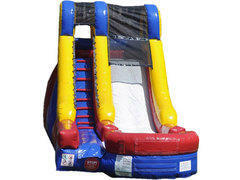 We offer smaller water slides for young children and yes, we have big water slides for adults also! 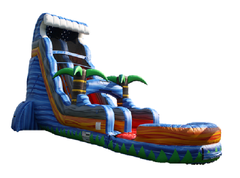 Clean, sanitized and well maintained inflatable water slides delivered to your party or event. All our inflatables and equipment are cleaned and sanitized after every rental to ensure a safe environment for all our customers. Not only are they cleaned once, but you will see the U Bounce Inc. team cleaning each bounce house again before you use it. Superb customer service with 5 star reviews on Google and Facebook. 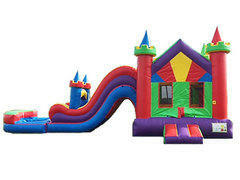 Professional full service inflatable bounce house company. No need to stress, our friendly, knowledgeable, well trained team members go over and beyond to insure you have a safe and fun event. We take pride in delivering only the best water slide rentals on time, every time. We guarantee it! For the best selection, reserve online today! U Bounce Inc. Inflatables & Party Rentals delivers inflatable water slide rentals to your event in Harrodsburg, Danville, Lawrenceburg, Lexington, Frankfort, Nicholasville, Lancaster, Stanford, Versailles, Richmond and throughout the Central Kentucky area. Don't see your area here? Give us a call!